I’m happy to be back with you today to share a fabulous sketch from Freshly Made Sketches. Our sketch hostess is the talented and oh so witty Linda Callahan. 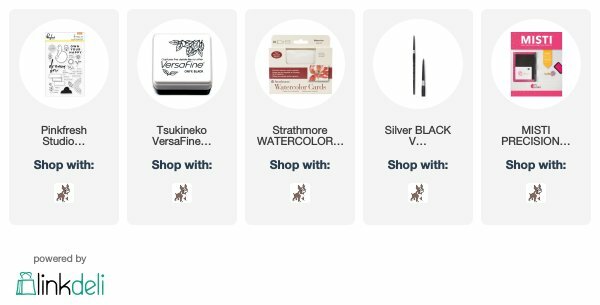 I love her whimsical takes on sketches and stamp sets! Her sketch this week reminded me of this little stamp set from Pinkfresh Studios called Dream On. 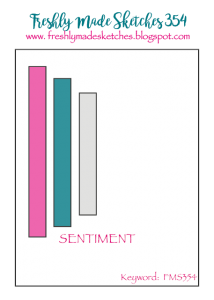 I love the little images and the sentiments in it and it had not gotten nearly enough use. I hope that I didn’t stray too far from the sketch but I’m sure Linda will forgive me if I did. I stamped the image onto a Strathmore Watercolor Notecard (these are the fabulous watercolor paper all pre-cut and ready to go with envelopes). I used Versafine Onyx Black and then watercolored with a new product from Clearsnap called the Dyestress Blendable Dye Inks. These are beautiful distress style ink in gorgeous colors. I just got them so I used this card as a bit of a palette test. Pretty, aren’t they?! I thought this sentiment kind of fit my mood as I was creating it. I know I didn’t make my usual Sept. 11th post yesterday but, truthfully, there is a lot going on with our family and I just didn’t have it in me. So in a way, this is my tribute card. It is hard in the face of tragedy to be happy. But it is ok to try to own it and allow yourself to heal and find joy. So I have this card for just the right day and just the right person. I hope that you have a wonderful and peaceful week. Take a moment to allow yourself to be happy! And for those of you who are facing hurricanes, fires and other tragedies, please know that I am thinking of you and your safety! Thanks for stopping in today. See you on Friday with lots of fun things! Happy Saturday to you! 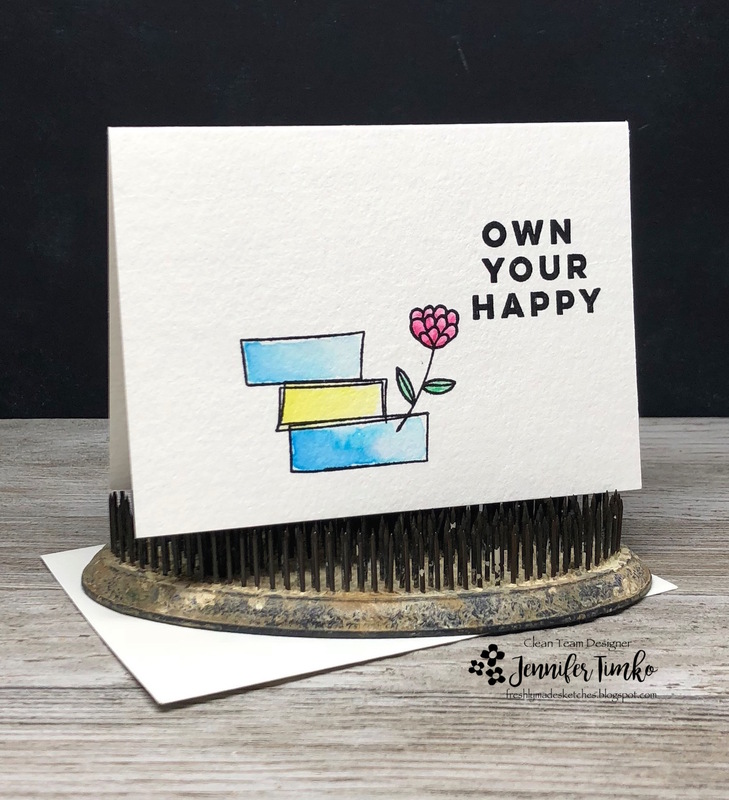 I’ve been busy creating for next week’s Newton’s Nook Designs April Release (starts on Monday) but I wanted to quickly share this card that I made for a friend. 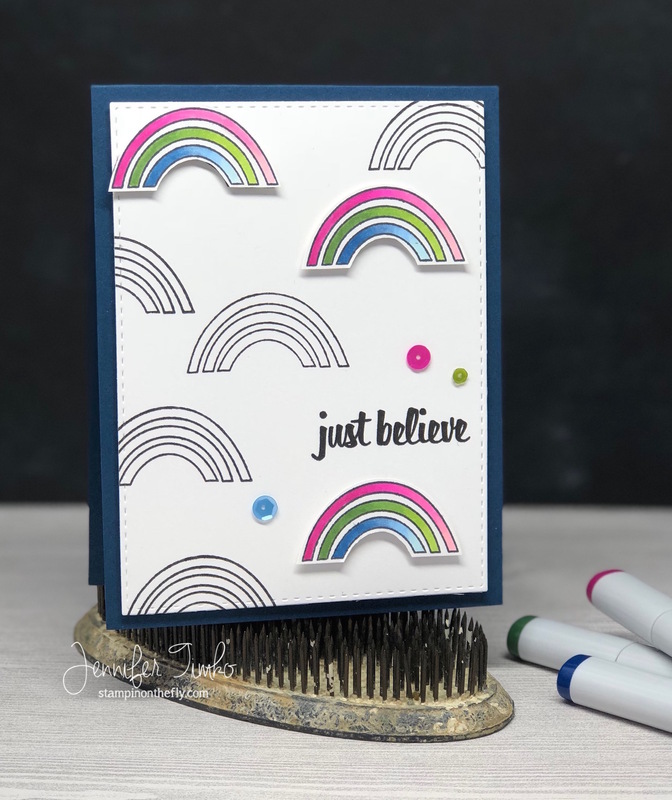 I got this sweet rainbow image in a set called Dream On (Pinkfresh Studio) at Stamping Away. Isn’t it darling? I thought it would be fun to use repeat stamping and then color a few. I used Copics to shade the rainbows in some bright, happy colors. Little images are perfect for this technique!! I found some coordinating sequins to add a little more color and then popped up the layer on a dark blue card base. I hope it will bring some joy to the recipient! Well, off to some more soccer….all soccer, all the time around here! Hope the day is great. See you Monday!